A widow confronting her grief by dating her worst match. A man fielding an unusual request from his father-in-law. A pair of robots stumbling through an awkward courtship. Love Me is a CBC original podcast about the messiness of human connection. For more, follow CBC Podcasts on Facebook and Twitter. A man falls in love with a mysterious woman... in a painting. And a note slipped into the back pocket of someone's jeans leads to a surprising late-night encounter. Plus, Lu's grandparents document their lives in very unique Polaroids. A woman goes to an ornamental shrimp society meet-up on a one-of-a-kind first date. Plus, the former president of Kiribati worries for his island nation's future as sea waters rise. And a poem about finding the courage to move deeper into a relationship. A mini episode where Lu shares her feelings about the holidays... and the movie Groundhog Day. And a daughter navigates grieving in public. A man obsessed with meet-cutes falls for all the wrong men and winds up in one mind-boggling situation after another. Will his dream of a fairy-tale romance come true? Plus, a poetic reflection on home, distance, and being your lover's pet whippet by Phil Smith. A woman tries to live her life while a stalker pursues her for over a decade; and a former U.S. Navy sailor is haunted by the memory of a woman he killed when he discovers a song has been written about her death. Have you heard the tale of the little girl who lost her leg while horsing around at the fair? A safety-obsessed father tells his daughter bedtime stories about freak accidents from around the world. Plus, one grandson remembers the tall tales his grandfather used to tell him, while another grandson searches for the truth about a grandmother he never new. Download What Can You Hear? Sara collects sounds of her son, her second child, during the first year of his life. Laughter, cries, shrieks of joy... Her first child never made much sound and died three days after she was born. The story explores Sara's connection to both children as she listens to the sounds of her family and grieves for the sounds that are missing. The Shadows is a fictional series about a young artist, as she struggles to make great work and find great love. Love Me asks for help on a new story and catches up with Tracy, the young woman who tries to meet girls through the art of punning. With raw honesty, Michelle Parise takes you along on her winding journey from lust to heartbreak, through loneliness and despair, to eventually finding the courage to face the question mark of life, alone. The series is available Sept. 19. Teenage punster Tracy talks to Lu about meeting girls through wordplay. Then, a young woman obsessively reads her boyfriend's diary to find out what kind of person to be. Plus, an artist charts the scents of her disintegrating relationship. A family of four examines their sleep habits, vying for the spare bedroom. And a 90s teenager's dreams come true when she visits the set of "Beverly Hills 90210" and meets her crush: Luke Perry. An ex-inmate is haunted by a man he knew in prison. And a pathway at the bottom of the sea reveals secrets of childhood. A murky relationship between a man, a woman and the fungus that lives in the woman's knee. Plus, a recipe for heartbreak. Featuring Seth Morris and a story by Tim Kreider. A man fields an unusual request from his father-in-law, and the story of a very special cherry tree. A man reminisces about a transformative nocturnal encounter, and the story of a lifesaving friendship with an overweight, toothless chihuahua. Mo and Tamim find themselves in the Jungle for very different reasons. When their paths cross, they develop an unexpected connection. Season 2 of Love Me launches July 10! Love Me explores the messiness of human connection with stories that will punch you right in the heart... in the very best way. Check out this sneak preview of the new season! Pen Pals is a new series from Love Me producers Mira and Cristal. In Ep 1, a posthumous textathon between Romeo and Juliet reveals he somehow wound up in Heaven, she in Hell. Featuring Paul Rust and Noël Wells. (Hear more eps on Stitcher Premium). Have a story about a relationship you want to share? Get in touch for a chance to be featured on the upcoming Season 2 of Love Me. Plus, while you're waiting for our second season, check out another new CBC podcast, Someone Knows Something. A little boy looks for love in all the wrong places. An introvert gets trapped in a room with 11 strangers. And a nurse works a night shift that turns her world upside down. A young woman reminisces about the friendship she once shared with the imaginative little boy she used to babysit. A dark cloud hangs over her memories as she recounts the incident that put an end to their fantasy world. After losing his mom to breast cancer, a young man befriends a series of older women. And after a dark time in her life, Donna, age 61, tracks down a suitor from her youth? who became a priest after she turned him down. Have you ever had a puzzling encounter with a stranger that you just couldn't wrap your head around? In this behind-the-scenes peek, producers Mira Burt-Wintonick and Cristal Duhaime join host Lu Olkowski to discuss the origin of the show. After a whirlwind romance, Brian and Vanessa get married and move to Kinshasa. Everything is going well until she shows up. It's a love triangle between the most unlikely trio. Plus, a mother wrestles with feelings of resentment towards her newborn baby. The journey of a son trying to figure out how to mourn his father: a millionaire turned convicted felon who committed suicide. And a short story by Pasha Malla about Dads with a capital D.
Two best friends have never met in person and one of them insists they keep it that way. Plus, a 1970s dating game show helps self-loathing Marsha learn to love herself again. All she has to do is choose between 3 suitors from her damaged psyche. Two strangers who don't speak the same language meet in Haiti and sparks fly... through Google Translate. Plus, untranslatable words of love, and a pair of robots navigating a tumultuous affair. 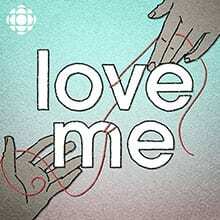 Love Me is a new CBC original podcast about the messiness of human relationships. It officially launches June 13, but here’s a sneak peek of what’s coming up this season.